Tallahassee, FL -- The Florida Society of Association Executives presented its most prestigious leadership award at the recent Annual Conference held at the Hyatt Regency Grand Cypress in Orlando, Florida. Each year FSAE awards an individual for his/her leadership, dedication, and professionalism in FSAE and in their current positions. Each recipient is nominated by their peers and then a committee reviews those nominations and selects the recipients according to a strict criterion of excellence and achievement. FSAE has been serving association management professionals throughout Florida for more than 50 years. 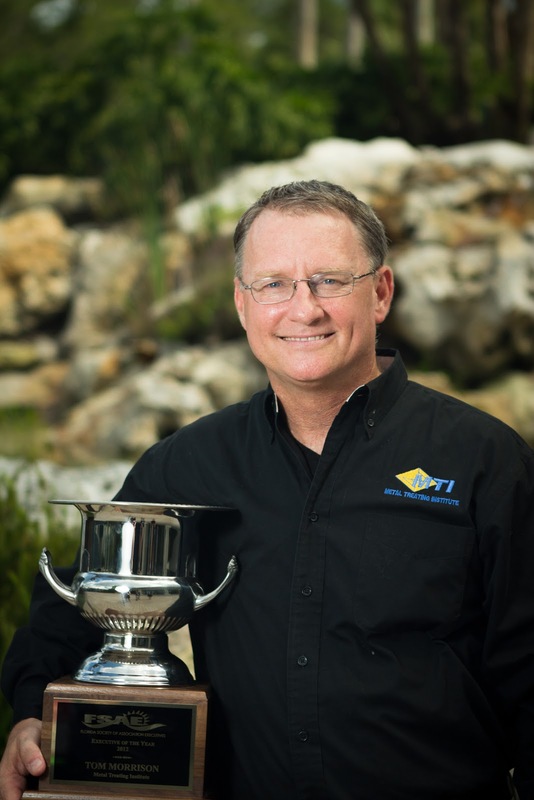 FSAE is proud to announce it awarded the 2012 Association Executive Member of the Year to Tom Morrison, CEO of the Metal Treating Institute, based in Jacksonville Beach, Florida. Tom stated after the award, "You never do what you do to receive awards, but it is an awesome honor to be recognized for your passion and work by those you serve." The Executive Member of the Year Award was created to honor the individual who have displayed the highest commitment to professional growth and pride in their field. Their professionalism and leadership are evident in both services to the association management profession and to the community.